SoundRoots World Music & Global Culture: But... We'd Never Attack a GOOD Mosque! But... We'd Never Attack a GOOD Mosque! It must be difficult being a giant multinational corporation with billions in sales. Just imagine the logistical and communication issues involved in making those vast piles of money. Still, it's hard to imagine how this magazine advertisement managed to slip through the layers of management at Boeing and get published in both the National Journal and the Armed Forces Journal. 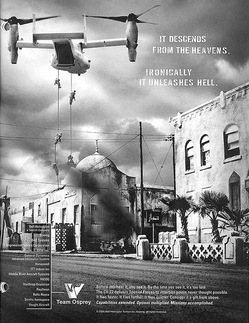 The ad depicts an Osprey aircraft depositing U.S. Special Forces onto the roof of a mosque. There are more than 6 milllion Muslims in the US - did Boeing imagine that none of them would see it, or perhaps that none of them would be offended? Close your eyes for a moment and picture the reaction if the troops were dropping onto a Jewish temple, or the Vatican, or the Taj Mahal. Boeing has already apologized, and will undoubtedly reinvigorate their cultural sensitivity training. But that won't erase this indelible confirmation that profit trumps culture (and plain old good taste) in some corporate circles. Unfriggin'-believable. Thanks dj for bringing this to our attention. I love the statement from Bell that their employee who approved the ad "didn't have the authority to do so." What the hell does that mean?? As for your blog 'intruder', if you note his URL you'll find he's prob. one of those who hates PBS kids shows that feature lesbian parents. Gotta protect our precious little ones fr. the real world & all its 'nastiness', right? I'd suggest (but it's completely up to you) you remove his link. Why should we progressives be improving the Google rank of someone so odious? Your implied support of the ad's message is disturbing, particularly since Boeing, Bell Helicopter, and the National Journal at least had the good sense to apologize for it.